Queensgate Shopping Center and the surrounding apartments was an 85-acre Schaszberger-Dempwolf farm until the end of 1959. The circa-1950 aerial photo shows the farmhouse, barn and ancillary buildings at the center of that farm in York Township. 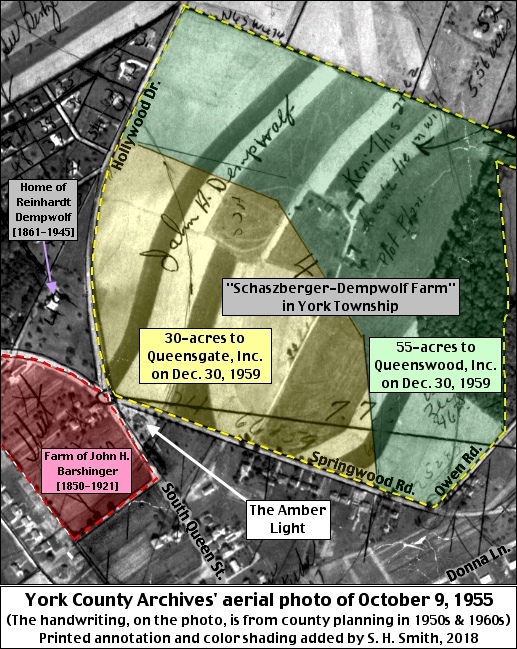 The “Schaszberger-Dempwolf farm” in York Township has the same immediate ownership string as the previously written about “Schaszberger-Dempwolf farm” in Springettsbury Township. John Myers is the owner of both farms per deed searches and per Beach Nichols 1876 Atlas of York County. Upon John Myers’ death in 1890, his daughters Caroline Myers and Amanda Myers, jointly own the farms. Caroline Myers conveyed her share of the farms to her sister Amanda in 1894. Amanda Myers was married to Edward Schaszberger; their daughters were Nellie Schaszberger and Annie Schaszberger. Architect Reinhardt Dempwolf was associated with his older brother architect John Augustus Dempwolf. In 1897, Reinhardt married Nellie Schaszberger, the elder daughter Edward Schaszberger. The death of Edward Schaszberger in 1921 resulted in Nellie (Schaszberger) Dempwolf and Annie K. Schaszberger each owning an undivided one-half interest in the two farms. Reinhardt & Nellie Dempwolf’s son John Armour Dempwolf was born in 1906. In 1930, the Reinhardt Dempwolf designed home, on the hill in the western corner of the farm in York Township, was built; present address is 2033 South Queen Street. Reinhardt likely sketched the following circa-1933 southward view of the farm in York Township. 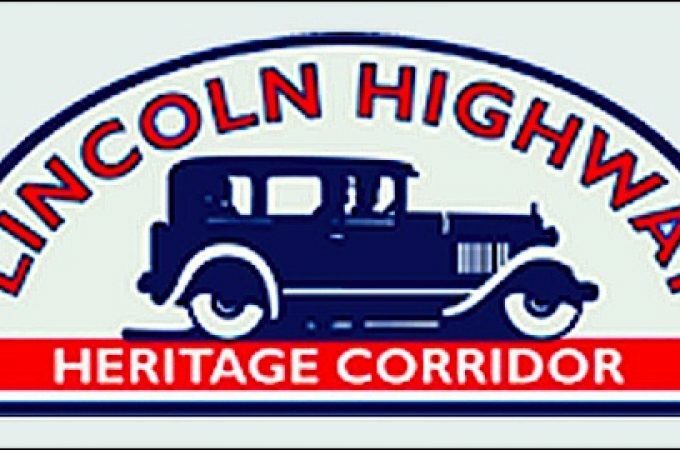 It shows the 1930 home in the lower right, plus roads of that time and crops planted in the farm fields. I’ve added present roads in red. 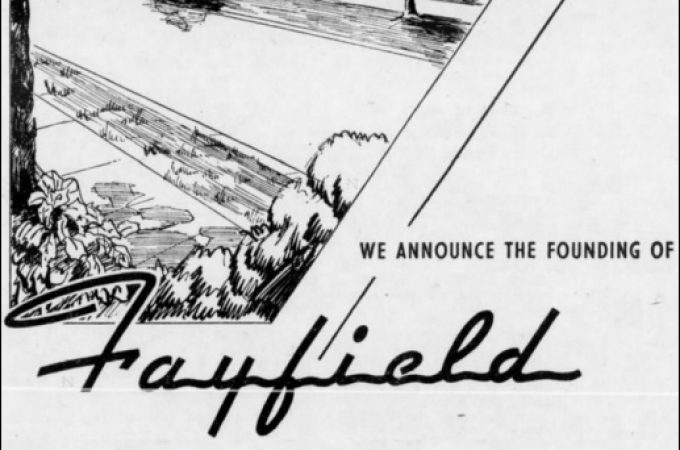 Before the sweeping Hollywood Drive cut across the farm, Green Hill Road was the main road to the east; and now the short remaining segment is named Sand Bank Hill Road, because this hill was formerly known as Sand Bank Hill. 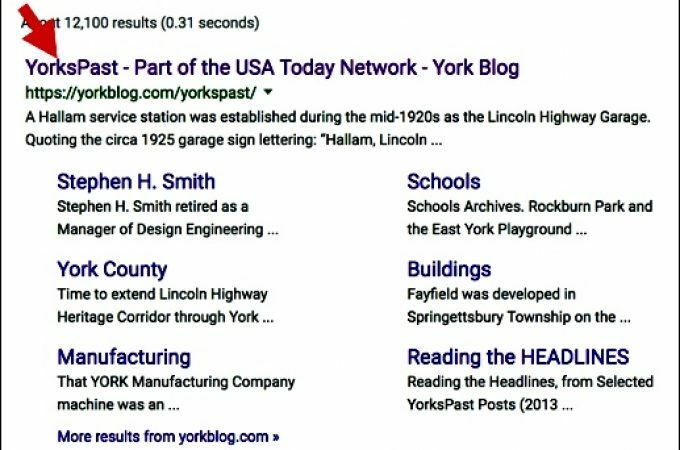 Click on this LINK for a yorkblog.com Full View of the three photos in this post if details are cut off in the cropping of the photos, or if any have been removed from the ydr.com site. 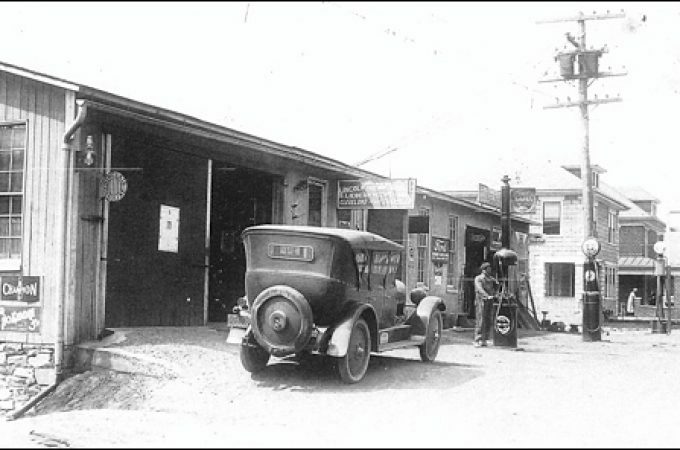 In 1930, John A. Dempwolf, Sr. married Margie Emig of Emigsville. Their son John Armour Dempwolf, Jr. was born in 1934. The deaths of Nellie (Schaszberger) Dempwolf in 1937, Reinhardt Dempwolf in 1945 and Annie K. Schaszberger in 1947, left John A. Dempwolf, Sr. as the owner of the 2033 South Queen Street home and the two Schaszberger-Dempwolf farms. The following 1955 aerial photo has been annotated to show the boundaries of the 85-acre farm in York Township, which John A. Dempwolf, Sr. and his second wife Hannah sold on December 30th, 1959. Queensgate, Inc. purchased 30-acres for the shopping center. Queenswood, Inc. purchased 55-acres to build apartments and the like. The lead photo and drawing, related to the Schaszberger-Dempwolf farm in York Township, were part of a larger donation to the Springettsbury Township Historic Preservation Committee, via John A. Dempwolf, Jr. and his wife Beverly. 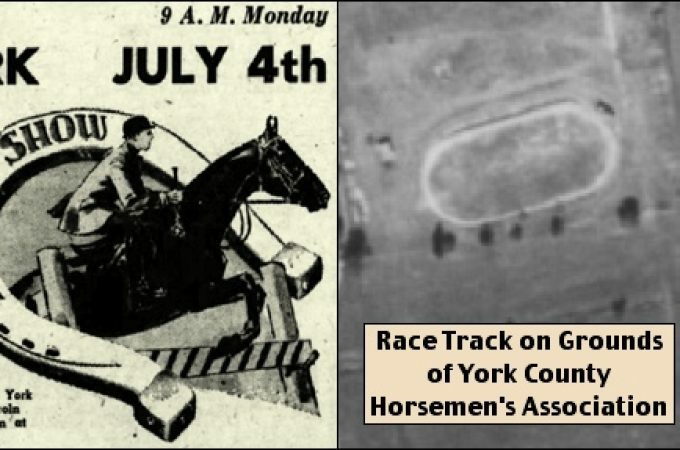 The drawing, photo and related documents have been made available to York Township for them to digitally scan; after which the originals will be donated to the York County History Center.